Maria Cannon from hobbyjr.org gets us started! Are you looking for activities that your kid can do that doesn’t involve a screen? Something that’s fun and educational? Hobbies are more than just fun for kids. When your child has a hobby they enjoy, it can play an important role in their development, help them build social and relational skills and boost their self-confidence. Here are five productive activities to consider for your child. Yes, this hobby involves a screen, but it’s still great for kids. Along with exercising their individual skills such as goal setting, researching, technical experience, reading and writing, videography can help them learn to work well with others. People skills are a major part of making videos. Whether it’s for a school project or with the other kids in the neighborhood, your child will be working with a crew and sometimes need to schedule meetings and interview people. It’s also the perfect hobby to encourage creativity and teach leadership skills, especially if your child is the one writing the story and directing the acting. If your kid learns to prepare a few good meals in their early years, they’ll be setting themselves up for success in the real world. Even for the youngest of chefs, who can’t actually help a lot and need constant supervision, exposing them to the kitchen could spark an interest that stays with them forever. It’s the perfect opportunity to show them what foods and ingredients are healthy and open a dialogue about the importance of eating whole foods. Teaching them to read nutrition labels will allow them to quickly tell the difference between real food and junk food. Cooking also teaches kids skills that can translate into other areas of life. If your kid likes doing things outside, bird watching is the perfect activity, and it’s something the whole family can get in on. Birding is simply watching and observing birds in their natural habitats, and it allows your kid to get more vitamin D and calcium from sunlight. It’s also beneficial to their mental health, because developing the ability to identify different species sharpens their focus and listening skills, while increasing their power of observation and memory. Birding can literally be done anywhere. You can bird watch in your backyard, go for a day hike in the mountains, or even on your family getaway to the beach. Transform your kitchen into a mini-science lab and engage your child in an eye-catching science lesson. You and your little scientist can use a few household items to create Rainbow Magic Milk. A few household items including a bowl, whole milk, dish soap, cotton swabs, food coloring and a baking dish are just the elements you’ll need to stir up an explosion of colors for your kids’ amazement. You can use this teachable moment to explain how dish soap interacts with fat molecules found in the whole milk to produce the magic. Sketching is another great activity for kids. Most kids have an inclination toward drawing at a young age and sketching with a pencil anything their heart desires is a way for them to creatively express their view of the world around them. Along with developing essential fine motor skills, sketching helps to sharpen visual analysis, concentration, hand-eye coordination and creative problem-solving. Additionally, it can be satisfying and lead to improved self-confidence. To get your kid started, all it takes is drawing paper, pencils, colored pencils and imagination. For hobbies that are done at home such as sketching or other indoor educational activities, it’s good for kids to have a workstation. Basements can be the perfect hobby room if you declutter and make the space for it. If you don’t have a basement, you can convert another area of the house with a little rearranging (i.e. an extra bedroom, a corner in the living room, etc.). The important thing is that your child has a comfortable place of their own where they can focus on the task at hand. Finding a good hobby for your child not only provides them with enjoyment, it helps them develop and hone important life skills. Videography, cooking, birding, science and sketching are just a few examples of hobbies that offer such benefits. Consider your child’s personality and inclinations, and pick a hobby to try out. It may take a few times, but you’ll find something that sticks! Danny Knight from fixitdads.com tells us how to do it! Outdoor play is not just fun; it’s an important part of growing up. Through the little games they play, children develop their motor, communication and problem-solving skills while exploring the world and exercising outside in the sunshine. If you’re the parent of the a child on the autism spectrum, you cannot let them miss out on this important part of their physical and mental development. Indeed, engaging with the world outside is an important element of sensory integration therapy, a fancy term that refers simply to practices that enhance how the brain reacts to touch, sound, sight and movement. Luckily, you have the perfect space for them to do this: your own backyard. Here’s how to transform it into the perfect educational playground. There are quite a few benefits here for the little ones. First off, making the bird feeder by using supplies from around the house is an excellent way to engage their fine motor skills as they use a variety of tools and materials to get the job done. Furthermore, there’s an element of sensory education involved as they see and feel the seeds that they pour into the feeder for their feathered friends to feast on. Best of all, it’s a wonderful way for any youngster to learn about the locally ecology and species that live in the area. It may just look like fun, but playing in a sandbox is a sensory activity used in a form of therapy called “heavy work.” No, that does not refer to autistic children putting in a few hours in at a construction site, but rather using force to move objects around, which helps develop their proprioceptive receptors in their muscle tissue and improves their motor skills overall. One of the most popular activities for this form of therapy includes filling up buckets of sand and pouring them around using buckets and shovels. Learning to swim offers enormous benefits for autistic children, according to the experts at Parents.com, by bringing a bit of fun into their lives while they build confidence and valuable muscle coordination. The safest way for them to get started is in your backyard under your own supervision, and there’s no need to install an expensive inground pool if you’re on a budget. There are plenty of low-cost options to choose from, and an inflatable pool gives them a place to splash around and cool off while engaging in more sensory integration therapy. This is another way to get your child outside for some exercise in a safe environment that will soothe their anxieties while they learn how food is produced, and can even provide your family with ingredients for a healthy diet. Autistic children learn how to accomplish a goal step by step while paying attention to detail and engaging their fine motor skills in the acts of planting, weeding, watering and harvesting, says a writer with Neural Balance. There’s also an important lesson to be learned in care and ownership. They’ll need to protect their hands while working, so invest in a kid-friendly pair of gardening gloves. It serves as a peaceful retreat when the rest of the world becomes a little overwhelming. Since this is a place of calm, it should have few windows or doors, be insulated from outside noise, and painted in white or neutral colors. You can also add some washable outdoor cushions and pillows for extra comfort. Be sure to choose a design that allows easy access so your child can enter and exit as they see fit, exploring the backyard at their leisure and returning inside for a bit of peace and quiet. With the right design, your backyard can be as therapeutic as it is pleasant during the warm summer months. All it takes is a little attention to design and a bit of elbow grease. Make it happen for your little ones, and watch them take on the world with joy and confidence. Check out my guest post for Harvard's Making Caring Common. The romanticizing of idealized love may work well in Shakespeare, but in real life, romantic relationships don't always provide the sunniest of seasons. Adults struggle with healthy romantic relationships as do young adults and teens. How can we change this? How can we start educating our children at an earlier age? Please continue reading below. Ralph Waldo Emerson said this about gratitude: “Cultivate the habit of being grateful for every good thing that comes to you, and to give thanks continuously. And because all things have contributed to your advancement, you should include all things in your gratitude.” Emerson’s message is clear: Gratitude should be practiced, always... Please continue reading below. As kids all across the country prepare for Halloween, the costume conversation is one that dominates households day and night. In my home, my two sons frequently have a change of plans. I’ve learned... Please continue reading below. Nut Job 2: How the Stars of the Film Spend Family Time + My Review! Animals on a mission! That's how Nut Job 2 draws you in. And in this world, you are definitely rooting for the animals over the humans! The film is filled with several themes; environmental protection, teamwork and caring for others. All of the messages are easily translated into a wonderful family discussion. And when it comes to family, the stars of the film gave a little insight during a press conference before the premiere of the movie, on how they spend 'family time' in their homes. They all agreed how important it is to make time for family bonding, love and care. Surly Squirrel- Will Arnett says his family goes outside together, they go to the park, get in the pool. They build Legos, they draw and lots of READING is happening! Hooray for Surly! Precious- Maya Rudolph says her family is a huge movie family. They cozy up, make popcorn and just relax. The Mayor- Bobby Moynihan says lots of their time is spent diapering... a new baby girl explains this type of family time! Jimmy- Gabriel Iglesias has a 19 year old son, they hang out together and Gabriel says he's kinda that 'cool' dad. Check out the trailer! Nut Job 2: Nutty By Nature opens August 11th. Enjoy the ride! The emails were beginning to pop up in my inbox, some as early as March from summer camp programs and mom friends alike, all in an effort to schedule the summer camp season. I hemmed and hawed not committing to anything. I politely avoided making any plans, thinking I would have to schedule some camp time at some point. But I just never got around to it. Check out my tips on HuffPost! School is in full swing now. Both of my boys are back on schedule. Jackson is in third grade and Asher is in second. And when I pick them up from school, I want to hear it all. I want to hear about every single part of their day. Heck, if I could, I’d be a fly on the wall. But I can’t, so it’s up to them to tell me what the day entailed and it’s up to me to get it out of them… EVERYTHING. The 'Summer Slide' is real. Statistics support it. Kids have a loss of learning, mostly in reading and math during the summer months. So how do you keep your kids in an active learning mode? Most importantly, you want to make sure your children enjoy it. Otherwise, it won't be fun for anyone involved. And remember, Summer is a time for relaxing, so do numbers 2 and 3 at your leisure. Let the learning happen naturally. Let your kids know you'll be working on a project together and that you'd like it completed in a week. See how involved they might get in making sure the project gets done. This is another way that they're learning and they don't know it... time management! Now have some fun learning! It's as easy as 1-2-3! Here's one example of the '1-2-3' Summer learning themed method in our home! One afternoon we made our way to the highest slide in the sky. It's called Sky Space. It's downtown Los Angeles. 1,000 feet high in the sky! 2) Write about the very fun experience! What a delight for me and you! You could see the sun! It was so high, my mom almost cried. Could you have done it again? 3) Create something based on the experience -get tactile! Jackson and Asher used Lego's to build the Sky Space slide. The object behind the slide is the elevator that took us up to the 70th floor of the US Bank Tower. I'm a Finalist in the 'Mommy Poppins-LA' Best of LA Kids Contest! I am honored to be a finalist in the MOMMY POPPINS Best of LA Kids Contest for my blog! Please see info below! HuffPost: It's Simple, You're a Great Dad! Happy Father's Day! You’ve been doing the daddy thing for 8 years now. You are my partner in parenting. We’ve been through it all... together. We haven’t always known what to do or how to do it, (They have kept us on our toes) but we’ve tried our best. I know I can be hard on you at times. My expectations are high. (You can thank my dad for that) I have never felt alone, though. I have always felt that it was a 50/50 deal. (cleaning is another story, no one is perfect I continue to tell myself) But when it comes to parenting, you are in it. You are present. I appreciate you. The boys appreciate you. We have a happy home. (It’s certainly filled with challenges) But Jackson and Asher know love and I’m so grateful for that. It was Saturday night. My husband and I had just come home from a happy date night out, dinner and a movie. Our home was calm and quiet. We thought we’d hear great things from the boys’ 12th grade babysitter... not so fast. Turns out it sounded more like the feature presentation that played out in our home was “Boys vs. the Babysitter” and the chaos had just come to an end. Our sweet babysitter was a bit shell shocked. She didn’t want to get the boys in trouble, but I urged her to tell me what went down. She said the boys fought with each other and were wild. Okay, the boys do fight and they ARE WILD. They are boys. Still their unacceptable behavior got worse. According to our babysitter, the boys told her: “We won’t go to bed unless you promise to bring us candy at 7:30 in the morning.” WHAT? I couldn’t believe what I was hearing. There was no way this behavior was going to be taken lightly. NO WAY. I never played a game of soccer in my life. When I was nine years old, I asked my mom if I could be on a girls’ soccer team. She didn’t even think about it. “No, sorry, I don’t want you to get hurt,” was her calm but unwavering response. I didn’t push it. I didn’t want it that much, I guess. Instead, I became a cheerleader on the “Little Red Devils,” my brothers’ soccer team. My dad was the head coach. Fast forward to motherhood: I am a mom to two boys, ages seven and eight, who are sports fanatics. They play sports, they watch sports, they even find ways in school to write about sports. According to my seven-year-old’s math teacher, he figures out his math problems by talking about touchdowns and two point conversions. This is Asher. He's six. He hangs from every door-jamb in our house. He literally jumps and moves, whenever possible, all day long. If you know him, you know this is not an exaggeration. So.... a few weeks ago when I happened to run in to two of the most amazing American Ninja Warrior stars ever, I could not contain my excitement. I immediately ensured a pic for my boys. And then this video message... from the sweetest (and toughest) ninjas ever! Whaaaat??? Asher and Jackson could not believe their luck. "Will we see them at Tempest?" they asked. Tempest is a Ninja training center, kinda near where we live, actually, not really. But we just started taking them there to work on their Ninja moves and now Brent teases that they might see them one day! NO WAY!!! Yep, that's the one and only Flip Rodriguez! One of the best and well known American Ninja warriors. And for the next hour, the dream is a reality, training with Flip! This is meaningful... during last year's American Ninja warrior competition when Flip fell into the water, Asher cried. Asher and Jackson love these guys. So to all you remarkably talented athletes, THANK YOU from the bottom of my heart. Your strength, kindness and passion is unique. You all are heros I'm happy to have my kids look up to! Congrats on a great season Brent, Kacy and Flip! We are all EQUAL, according to a four year old! Yesterday, when I picked up my guys from preschool, I asked Jackson, "What did you learn today?" I ask both of my kids that every day on the ride home. Usually they tell me that they can't remember or that they don't know. They are only three and four after all. But I hear I should expect that same answer in elementary and high school as well. Anyway, back to the point. Jackson's answer was different this time and it was exciting to hear. He said he learned about "Luther Martin" - obviously he meant Martin Luther King. My interest piqued quickly. I said, "What did you learn about MLK?" He said, with a strong voice, arms raised and all five fingers pointed, "WE ARE EQUAL!" I told him he was right! He asked for clarification as to what equal means and I told him that if someone is allowed to do something, say, like a kid wants to play Superheroes (that's what he is focused on 24/7) everyone can play Superheroes... even babies and grandparents. He nodded and said it again, "EVERYONE IS EQUAL!" I thought about our conversation later that night and smiled to myself that my very young children can understand the concept of equality. We teach that in our home, but the reinforcement in the classroom makes me proud of the school my children attend. And to me, it means even more than that. This provides an effective anti-bullying lesson. Jackson's teachers didn't talk about bullying during the MLK conversation, but the concept is clear. I hope this will remain with my children and I plan on making it a high priority. And isn't it timely? Just this week, the governor of California, Jerry Brown, signed a bill making California the first state in the nation to add lessons about gays and lesbians to social studies classes in public schools. The landmark bill requires public schools to include the contributions of people who are gay, lesbian, bisexual and transgender in social studies curriculum. In a statement the governor said, "History should be honest. This bill revises existing laws that prohibit discrimination in education and ensures that the important contributions of Americans from all backgrounds and walks of life are included in our history books." So I say, "Hooray!" I know we have a lot of work ahead of us as a society, but we are making strides. Beginning in preschool and continuing all the way up to state government... and beyond we CAN teach our children what Martin Luther King wanted us all to LIVE. 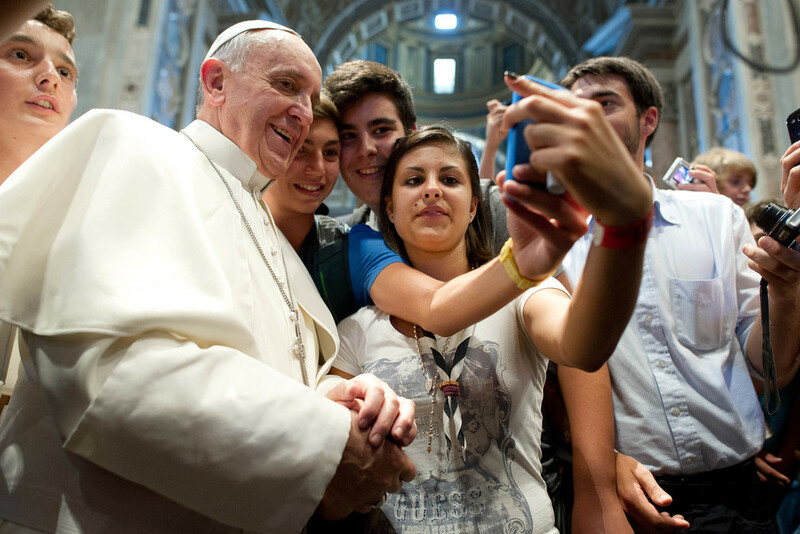 I follow Pope Francis on Twitter... and I'm not alone... millions and millions all over the world do. We all have our own reasons for following, but for me I use his tweets as a tool toward being a better mother. Weekly or even daily reminders help me internalize what is really most important. According to the New York Times, "President Barack Obama is still by far the most followed world leader on Twitter, but Pope Francis is considered the most influential by the number of his messages retweeted." And even though Pope Francis does not write his own tweets, he does approve of the messages that go out. They usually come from his homilies, speeches, or official documents. In his most recent LIFE magazine cover "Pope Francis in America, The Spirit of His Revolutionary Mission," it's evident his reach and presence in our world is undeniable. And with all that, still he is able to deeply touch me, just a regular mom, with his grace and love. Just this week, this inspiring tweet: "God loves the lowly. When we live humbly, he takes our small efforts and creates great things." What a beautiful endorsement to teach our children how to try their best and be humble always. His availability and message, to all of us, is so clear in pictures. "Dear parents, have great patience, and forgive from the depths of your heart." "A great challenge: stop ruining the garden which God has entrusted to us so that all may enjoy it." "Beware of getting too comfortable! When we are comfortable, it’s easy to forget other people." "It is so important to listen! Husbands and wives need to communicate to bring happiness and serenity to family life." "There is so much noise in the world! May we learn to be silent in our hearts and before God." And I found this phrase in one of his homilies, which we all know we should do, but for some reason, coming from the Pope, it just seems so simple. "A healthy family life requires frequent use of three phrases: 'May I? Thank you, and I'm sorry' and never, never, never end the day without making peace." So as Pope Francis embarks on his journey to the U.S. and the anticipation builds, I humbly pray for a safe and successful trip for the People's Pope. Only hours ago he tweeted and asked for prayers. "I ask you to join me in praying for my trip to Cuba and the United States. I need your prayers." Living, Learning and Supporting the Adventurous Spirit! In the turquoise waters of the Carribean, Jackson and Asher could not be happier. The guy in the middle is Manny. He's from Turks and Caicos, known as a Belonger. He is the boys' new best friend. This is a short "picture book" like story of how Manny gave my kids their latest lesson in living an adventurous life... and helped me, mom, let go... just a little. First off, life on top of the world. (really on the top deck of the boat) Lesson number one: Take it all in. Snorkeling in the middle of the ocean, anyone? Lesson number two: Fear not! Sometimes things can get a bit messy and unattractive, go for it anyway! Lesson number three: give each other a white sand facial! Lesson number four: Don't EVER let ANYONE keep you from forging on! It's your adventure, you can tame any iguana you want to. Even this funny looking guy on Iguana Island. Listen to those with experience is lesson number five. Manny shows the boys how to feed seagulls fresh conch. Last, but not least, follow your heart. Lesson number six: You are the captain in your adventurous LIFE! Just a little footnote from mom to Asher: sometimes mischief can get you into trouble, my little-tiny. Teach Your Kids to Talk to You! We all want our kids to talk to us about their lives. We want to know what makes them happy, what makes them sad. We want them to open up! So how do you do that? You can teach them, nudge them to spill the beans. My advice: Be like a reporter and DIG! But DIG carefully. Check out the video below, it may give you some new ideas on how to get your kids to talk to you! Here are some quick tips that have worked for me!